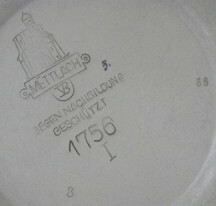 This short article describes the most common marks found on stoneware items manufactured by the Mettlach factory of Villeroy and Boch, including trademarks, form numbers, decoration numbers, and capacity and date codes. While many others were used, the marks examined in this article will cover the majority of the marks you are likely to encounter, unless you have an extensive and advanced collection of Mettlach. The two most commonly found trademarks are the incised abbey mark and the painted or stamped Mercury mark. The abbey mark, frequently referred to incorrectly as a "castle", is a representation of an 11th century abbey which still stands today in the village of Mettlach. This trademark, among other marks, was pressed by hand into the bottom of the piece. 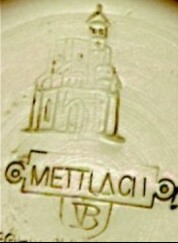 The mark consists of the abbey above a banner, or placard, which includes the word "METTLACH" and the joined letters V and B (for Villeroy and Boch). These two elements of a single mark were actually applied separately, and as a result, it is common to find examples where they are not aligned exactly as in our example. The incised abbey mark was normally used on relief, etched and cameo wares, and on some later print-under-glaze or PUG items. 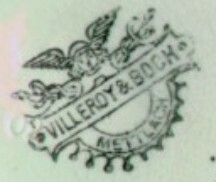 The Mercury mark, usually stamped in green but also known in blue and black, shows (from the top) the head of Mercury with a winged cap, two caducei or snake-entwined staffs, a banner or placard with the name "VILLEROY & BOCH", and a fancy semicircular banner bearing the factory name. This mark was also applied by hand, but stamped rather than incised. It was commonly used for marking PUG items. 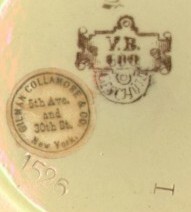 Collectors owe great thanks to Villeroy and Boch for marking their items so well. Even so, there are many variations in the marks which are not fully understood today, and it is not unusual to find a Mettlach stein without a trademark. In addition, even when items were fully marked with the Mercury trademark when they left the factory, because it is stamped in ink this mark frequently deteriorates over the years, so that mere traces of the blackish-green ink may be all that remains. 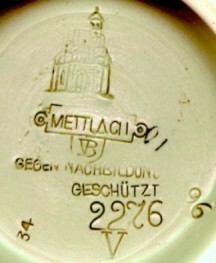 The base shown to the right once included two marks stamped in green ink, the Mercury mark above a second mark stating that the stein was "Made in Germany". Even when there is no trademark at all, Mettlach items can frequently be identified with confidence. The easiest way, assuming the piece does bear a form number, is to look it up in a Mettlach reference and confirm the design and other characteristics. In the rare case that there is no form number, you must rely on other characteristics and knowledge of Mettlach wares, and the task becomes both more difficult and less certain. 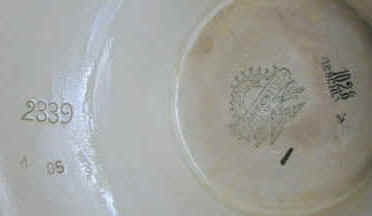 The figure to the right shows the prototypical base marks on an etched stein, in this case form number 2276. Except for the unexplained "10" marked in black ink, all of these marks are incised into the body of the stein. the words "GEGEN NACHBILDUNG GESCHÜTZT" which means "protected against copying"
Most of these marks are straightforward, but the capacity or size code needs explanation. This code originally indicated the relative size of the piece among all of those sharing the same form number, with Roman numeral I indicating the largest. Later the scheme was changed to indicate the absolute capacity of the piece, with I representing the one-liter size, II being for the half-liter, and so on. The V shown in this illustration signifies a quarter-liter capacity. To the left we see another typical set of Mettlach base marks. While the abbey trademark is slightly different, it is easily recognizable and should not be confused with the marks of any other factory. The form number (1756) and capacity (I) identify this stein as one of the tapestry and relief models in the one-liter size. The date code to the right indicates the stein was made in 1888. The "mystery number" is still a mystery, although it has been suggested that this number is indicative of the area in the factory where the item was produced, or perhaps identifies the primary decorator. Here we also note a hand-inked "5." Mettlach wares frequently display one or more such numbers, sometimes in gold paint. It is generally thought that these numbers identified the person or position in the factory where certain hand operations were performed during decorating. This number and the mystery number were both likely elements in Mettlach's overall quality control process. Turning now to the marks which are found on PUG items, the figure to the right shows all of the elements which we expect to find. [This example is actually from the base of a PUG punch bowl by Heinrich Schlitt.] The trademark in this case is provided by the stamped Mercury mark. 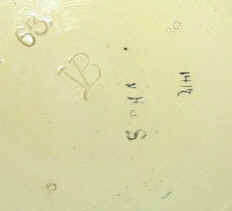 The incised form number is 2339, the unexplained "mystery mark" is "1" and the date is (19)05. The stamped black number "1028" is the decoration number. 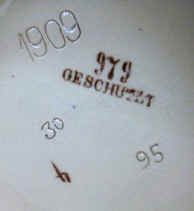 The word "GESCHUTZT" appearing in black ink below the decoration number means that the design is copyrighted. This is one of numerous words and phrases which you many encounter on Mettlach wares. PUG items are frequently referred to by the combination of decoration and form number, as 1028(2339). This is particularly useful in the case of PUG steins, where many different designs were applied to the same body. The most common forms for PUG designs are 1526 (ranging in size from quarter-liter to three-liter), and 1909 (quarter-liter to half-liter in size). While the majority of PUG decorations appear on only one form and in only one size, some were applied to more than one form, and a few to the same form but in more than one size. The final figure in this article shows the base marks on a PUG stein which does not bear a trademark. Even so, it is quite easy for a collector who is familiar with the marks and forms to identify this stein as being produced by Mettlach. In this case the form (1909) is one of the most common PUG forms used by Mettlach. 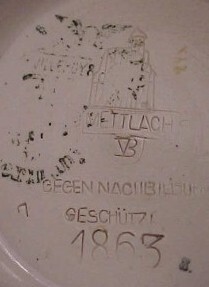 Despite the absence of the trademark, all of the rest of the marks on this stein, including the decoration number, are characteristic of Mettlach. Of course, if anyone is still uncertain, it's a simple matter to look up 979(1909) in reference works to confirm the design and perhaps even view a picture!